A four-hour police standoff at a downtown Spokane motel ended Monday evening when the suspect emerged onto a second-floor balcony while repeatedly stabbing himself with a knife. 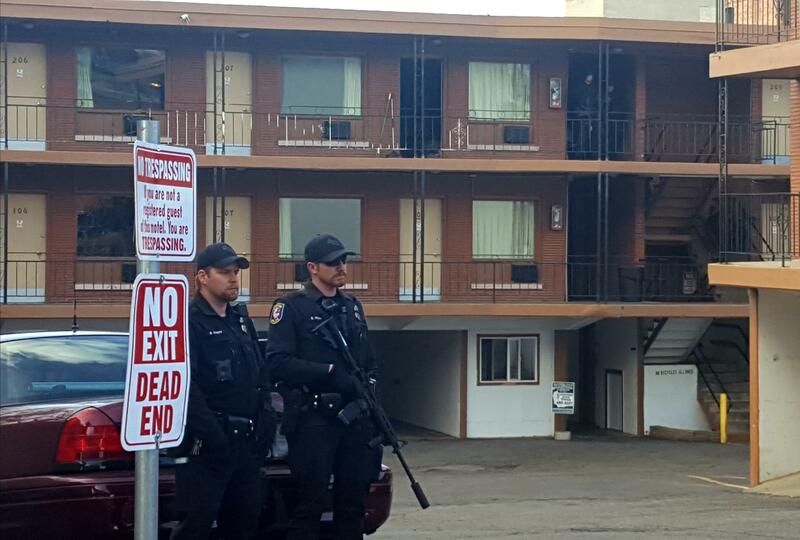 SWAT officers fired “less lethal” rubber-tipped rounds to disarm the suspect, 53-year-old Jimmy R. Engleman, at the Downtowner Motel, 165 S. Washington St. He was then strapped to a gurney and taken from the scene in an ambulance. Engleman had been wanted on a bench warrant stemming from a 2018 standoff at a residence near North Post Street and Wellesley Avenue. In that case, police responded to a report that Engleman was shooting at neighboring homes on the morning of May 19. He surrendered after agents deployed chemical agents, and was charged with multiple counts of first-degree assault. According to an online court docket, Engleman was ordered to undergo a psychiatric evaluation in August to determine whether he could stand trial. The bench warrant was issued March 22 after he missed a court appearance. Officer John O’Brien, a police spokesman, said Monday’s standoff began about 3:15 p.m. when patrol officers and U.S. marshals learned Engleman was in a room at the Downtowner. They knocked on the door and shouted, but he refused to come out. The SWAT team, police dogs, negotiators and explosives experts were called to the scene, along with two armored trucks and dozens of patrol vehicles. Officers shouted commands into a megaphone and deployed three percussion grenades in an effort to rouse Engleman from his room on the second floor, while onlookers and evacuated motel residents lingered along Second Avenue and Washington Street. “This could have easily been a deadly force type of situation,” O’Brien said. The explosives team managed to open the locked door, and then after waiting for some time, officers “used chemical munitions to try and influence Engleman into a peaceful surrender,” O’Brien said. Engleman emerged from his room, stabbing himself, around 7:30 p.m. He was taken to a hospital, and his condition was not immediately available. O’Brien said Engleman would be booked into jail after his release from the hospital. Published: April 15, 2019, 9:01 p.m. Updated: April 15, 2019, 10:03 p.m.